Sweden´s political elite gather at the annually arranged summer event Almedalsveckan, which is held in Visby from June 29th until July 7th 2014. More than 25 000 visitors are expected and they can choose to take part in 2 800 different seminars and happenings around the city. Almedalsveckan is always observed by the media and this time around the event is guaranteed to be followed up closely due to the Swedish election in autumn. This year is the second time that the project Midway Alignment of the Bothnian Corridor is participating in Almedalsveckan. 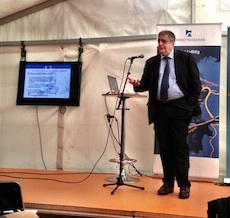 The project has hosted a breakfast event and a seminar. During the week the cross-border cooperation between Umeå and Vaasa, which has recently evolved in the establishment of a joint port corporation called Kvarkenhamnar AB, is presented widely. Also the joint shipping line NLC Ferry and the EU-funded project Midway Alignment of the Bothinan Corridor are being presented. Discussed topics are how the cooperation between two countries promotes regional development and strengthens the European transport network (TEN-T). –I’ve been to this fascinating event once before. The fact that the European Commission is here to show what we do and how we work to advance matters means a great deal. An interesting phase has just started within the TEN-T program. A new time slot will open in September, during which countries can apply for the amount of €20 billions to the shared, says José Anselmo, advisor for Motorways of the Sea, DG Mobility and Transport. –Looking at our experiences from last year, we know that the functioning cooperation with our neighbor country calls for us to be present at top events like Almedalen. Us being here, being able to talk about the Midway project in this inspiring surrounding, is just terrific. Our goal is to prepare the handing in of our application for phase 2 within the project, tells Mathias Lindström, Director of the Kvarken Council and Project leader of Midway Alignment. –I found the workshop program interesting. We got the chance to present our project and high light the project´s benefits. We also found linkages between different projects. For example through the cooperation between the Norrbotniabanan railway and Bothinan Corridor we´ll be able to go a lot further, thinks Isabella Forsgren from INAB. Midway Alignment of the Bothnian Corridor is a project that is being coordinated by the Municipality of Umeå and the City of Vaasa. The project works closely with partners from business life and different regional players.